A couple of days back Xiaomi confirmed to launch its new Xiaomi Play smartphone on December 24. Xiaomi on its official Weibo account shared teaser poster revealing the device to come with a waterdrop notch and three different color option, which includes Black, Dream Blue, and Dawn Gold color options. 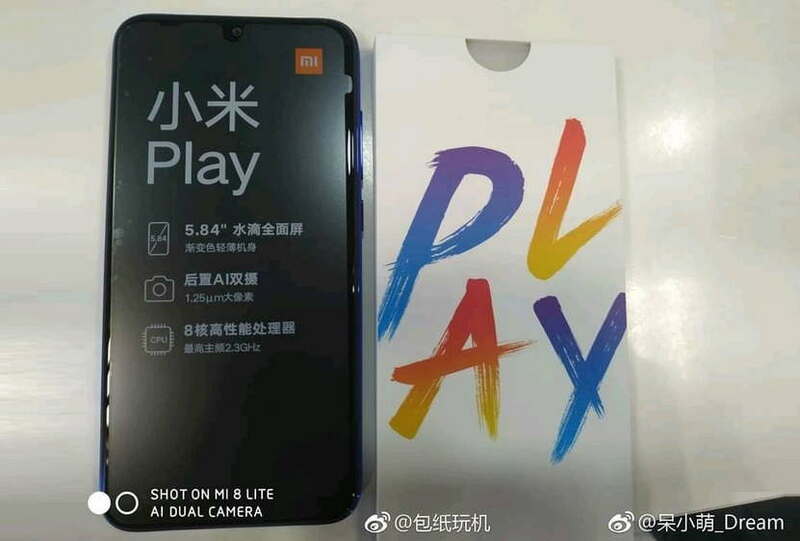 However, one more day to go before its final launch and just ahead of it, we now have the actual image of the upcoming Xiaomi Play device along with its retail box. The live image of the upcoming Xiaomi Play appears to be a Dream Blue color variant. We can also see the screen protector which appears to have the screen size, camera configuration and processor info printed on it. The printed detail shows the upcoming Xiaomi Play smartphone to feature a 5.84-inch 1080×2280 resolution full-view display with a waterdrop notch, that we can see on the device itself. The screen protector also shows the processor used on the device, which seems like a MediaTek flagship chipset. However, we are not sure that which processor the upcoming Mi Play will have, maybe it is a MediaTek Helio 90. The recent teaser posters have already confirmed several key specs of the device. 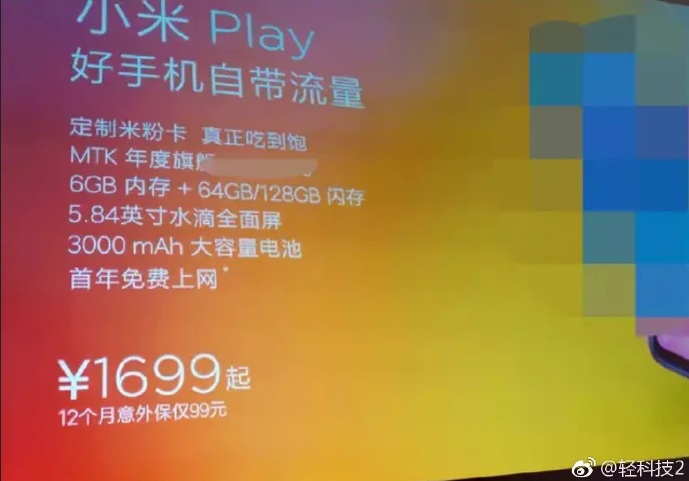 However, some new leaked images from Weibo have also revealed other key details about the upcoming Xiaomi Play including some other key specs and its price. The new leaked images show the device to come with 6GB of RAM coupled with 64GB and 128GB of storage. The device features 3,000mAh battery to keep the lights on. As for the price of the Xiaomi Play, Weibo image shows that the device is priced at 1,699 Yuan in China, which makes it around Rs. 17,000 Indian rupees.